Art blogger Hrag Vartanian seemed surprised this year to discover someone selling a GIF at the Armory Art Fair. 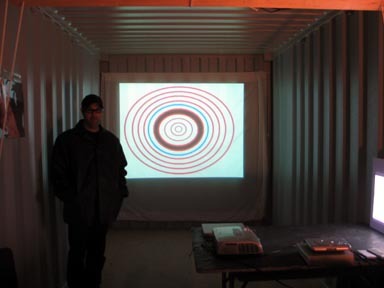 Since no one can be expected to dig through my old blog archives, I fished up this photo by Paddy Johnson, depicting Aron Namenwirth of artMovingProjects gallery selling an animated GIF (mine) at the DIVA art fair in Miami in 2006. DIVA's web page of the event is still up, as well. Is a DVD of a GIF still a GIF? Many might say no--you'd have to see it and judge. In an ARTINFO column about digital art and $$$, Kyle Chayka ponders, among other things, the sales practice of "taking a GIF offline so the collector can have it locally" (which we did not do at DIVA--what was offered was an authenticated copy of the art, not the rights to the image) in light of a recent Frieze essay about the supposed differences between digital and gallery style art: "broadly speaking, the art world is vertical (escalating levels of privilege and exclusivity) whereas the web is horizontal (based on free access, open sharing, unchecked distribution, an economy of attention)." That the same person uttered both phrases is a mystery no one, including Chayka, can solve, but let's move on. Limiting edition sizes, or selling the rights to one person, could both be means of creating what the Frieze essay calls "scarcity" and Chayka calls "artificial scarcity" that presumably enhances monetary value but is contrary to the spirit of open sharing and unchecked distribution. Which method you use is mostly a matter of optics: "having the GIF locally" provokes hoots and hollers because of the mental image of some plutocrat in his den cackling over "his" GIF while the thing circulates uncontrollably out in the real world. Whereas an editioned DVD or data disc, authenticated by the artist, isn't so extreme and has ample precedent in the art world. But let's get back to that idea of "scarcity." Is that really what this is about? Art economics aren't classical economics. Even in the most ruthless Chelsea shops, sales aren't just about exchange value affected by laws of supply and demand. There are elements of generosity, patronage and support for artists (as well as status, ego, and loss leader financing) that don't factor into the typical capitalist dog-eat-dog scenario. Certainly rarity impacts value but limited editions are also a way of helping artists get paid when they mostly don't. Talk of "scarcity" and "escalating levels of privilege" is the art world in faux-Marxist, self flagellation mode, justifying consumption while supposedly critiquing it. Also, contrary to Frieze, there are reasons for making art gallery-friendly besides creating a "saleable object." When a web artifact is shown in physical space, the viewer's relationship to it changes--you can walk around it, or walk through it if it is projected, and you can discuss it with other people rather than having a solitary passive encounter with it on a web page. Believe it or not, some artists are interested in these transformations for their own sake, not as an after-the-fact justification of their desperation for money.